Described as the first celebrity athlete, John Lawrence Sullivan had been born in Roxbury, Massachusetts, in 1858 to Irish immigrants Michael and Cathleen Sullivan. 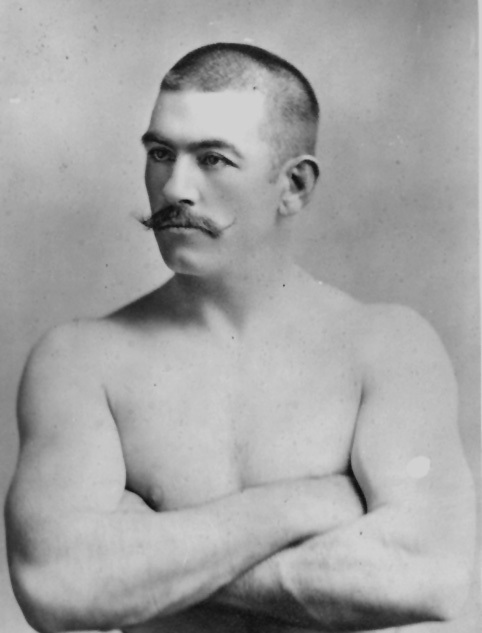 Growing to local prominence as the "Boston Strongboy", Sullivan later toured nationally, winning over 450 fights in his career and garnering a national reputation as a bare-knuckled boxer. Sullivan parlayed his athletic prowess into a million dollar fortune and he developed a devoted following in both the sporting and the Irish-American communities. Following his defeat on September 7, 1892, at the hands of James ("Gentleman Jim") Corbett, Sullivan retired to a farm on Hancock Street in Abington, Massachusetts, though he subsequently took part in a number of exhibition matches after that date. He later worked at a variety of occupations including stage actor, sports reporter and public speaker. handlebar moustache remained a giveaway. ﻿The Men's Club meetings consisted of supper and talks on various topics. Open to men of all denominations, the meetings were remarkable for though they were sponsored by the church "there was a social atmosphere at the gatherings, minus evangelical activity." With such a noted figure as Sullivan on the schedule, the November meeting was not surprisingly one of the club's most popular. 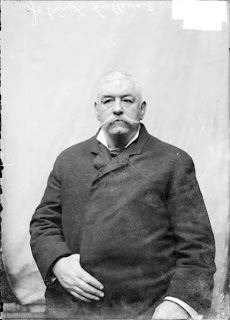 The Sullivan who appeared in Middleborough, however, was not the Sullivan recalled by most, his corpulent figure a product of a lifetime of overindulgence in food, alcohol and tobacco. James H. Creedon later recalled Sullivan at the meeting chain smoking cigars. "He had a wonderful breathing system, as his lung power when smoking a cigar caused the fire to slide up the wrapper of the cigar with great speed. A cigar was burned in a short while, under his expert puffing." In order to keep pace with Sullivan's habit, Walter L. Beals "supplied [Sullivan] with a fresh smoke as he burned them, one after another." Interestingly, Sullivan seems to have spoken to the gathering about nearly everything except boxing. At the time, tensions were mounting between America and Pancho Villa in Mexico, and both that subject as well as developments in the European war were addressed by Sullivan. "He also had a word to say about the liquor question, which at that time was pretty much a discussed issue, and he felt he was a competent speaker on the subject, having played on both sides." The correspondent at the November meeting remarked that he former boxer "was definitely 'on the wagon,' during the era of his Middleboro visit." Sullivan, in fact, by that time had become a noted spokesperson for temperance, speaking before many church groups on the topic. Sullivan died two and a half years later in February, 1918. Hats off to the Great John L!